Moist and fluffy paleo banana muffins made with almond flour and pure maple syrup. 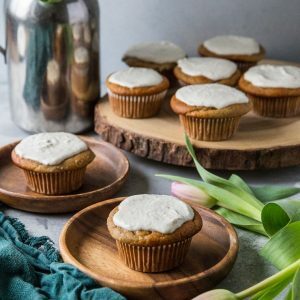 Topped with a dairy-free cashew based “cream cheese” frosting, these muffins are a true delight! There’s something so comforting and nostalgic about banana muffins. The warm, sweet, cinnamony, banana bread aroma warms the soul! My mom would bake banana bread or banana muffins on repeat when I was a kid, so the treat holds a special place in my heart. These grain-free banana muffins are just as soul-filling, belly-warming and comforting as a classic banana muffin. 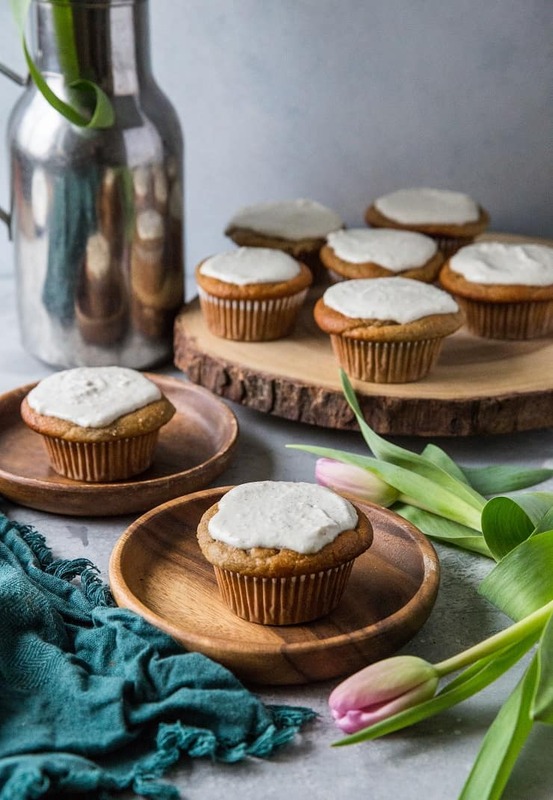 Made with 3 ripe bananas and almond flour as the primary ingredients, these healthy muffins have a nice nutrient profile. 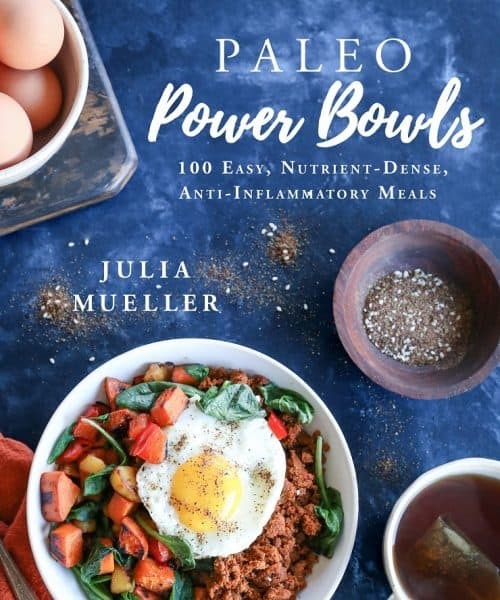 These paleo banana muffins are a spin off my classic Paleo Banana Bread recipe, which I basically use on repeat as my base for so many treats. Plus, they are refined sugar-free, dairy-free, oil-free and great for those who are in the habit of bringing healthy snacks on-the-go. I thought I’d take these banana muffins a step further by making a vanilla bean “cream cheese” frosting for them. 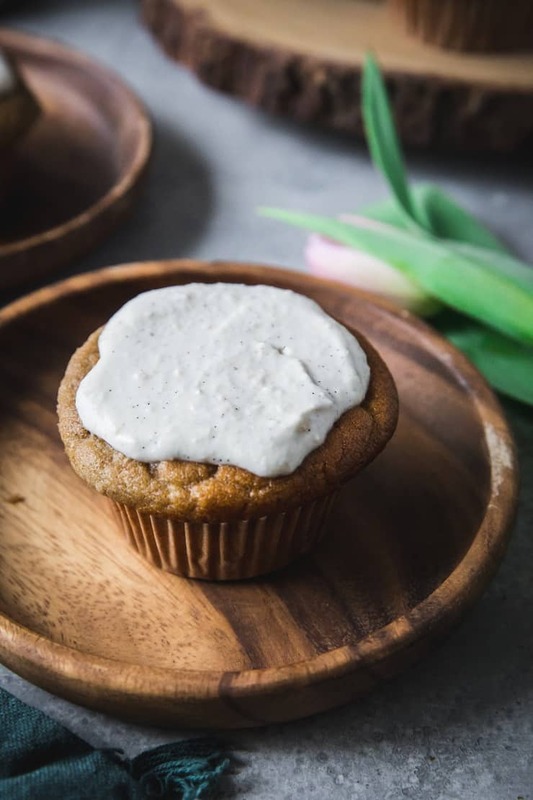 The “cream cheese” frosting is made using soaked raw cashews, pure maple syrup, lemon juice, almond milk and a vanilla bean. 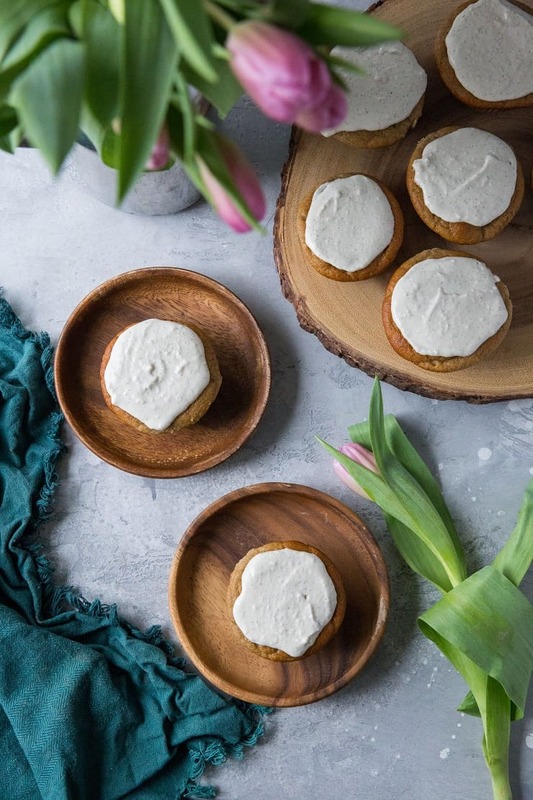 You’d never know this healthier frosting is completely dairy-free and refined sugar-free! 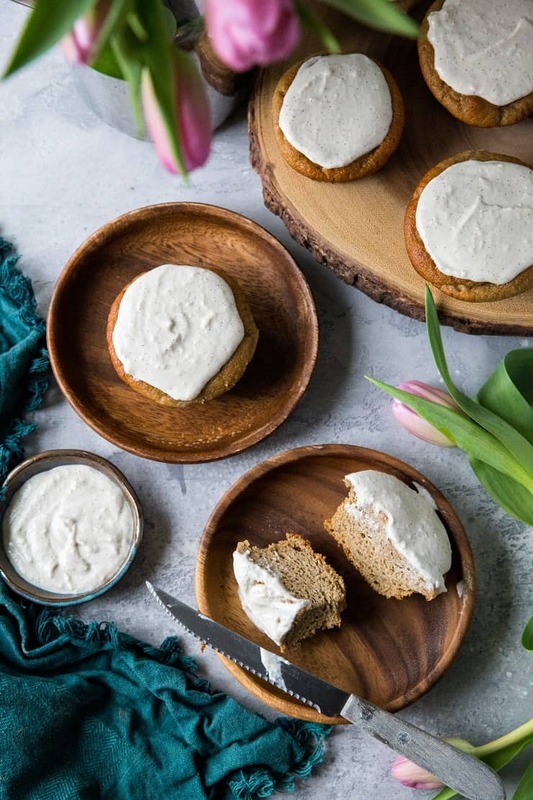 The vegan cream cheese frosting is a scaled down version of my No-Bake Vegan Cheesecake, so you know it’s gotta be good! It’s easy to whip up and gives you the sense that you’re eating a sinful cupcake. If you don’t have a vanilla bean on hand, no sweat. You can replace vanilla beans easily with pure vanilla extract. I find 2 teaspoons of pure vanilla extract yields a similar vanilla essence to 1 large vanilla bean. Start this recipe by first soaking the raw cashews. You can soak them for a minimum of 2 hours, but ideally overnight so they soften up quite a bit. After the cashews are sufficiently soaked, drain them and add them to a high-powered blender with the pure maple syrup, lemon juice, almond milk, and the scrapings of a large vanilla bean. Blend until completely smooth! Transfer the frosting to a sealable container and refrigerate until you’re ready to use it. The frosting will thicken as it sits in the refrigerator. Prepare the muffin batter by mashing 3 large ripe bananas in a mixing bowl. Whisk in the eggs, pure vanilla extract, and pure maple syrup. In a separate bowl, stir together the almond flour, tapioca flours, baking powder, sea salt, cinnamon, and chocolate chips. Pour this flour mixture into the bowl with the wet mixture and stir well. Transfer the batter to a muffin tray and bake! Once the muffins have cooled, remove them from the muffin tray and frost them with the vanilla bean cream cheese frosting. Share with loved ones and enjoy! If you make these Paleo Banana Muffins, please feel free to share a photo and tag @TheRoastedRoot on Instagram! Place cashews in a bowl and cover with 1 inch of water. Soak at least 2 hours, preferrably overnight. Drain the cashews and transfer them to a high-powered blender along with the remaining ingredients. Blend until completely smooth. Transfer frosting to a sealable container and refrigerate until ready to use. Preheat the oven to 350 degrees F and line a muffin tray with 9 muffin papers. Mash the bananas in a mixing bowl, then mix in the eggs, pure maple syrup and vanilla extract. In a separate bowl, stir together the remaining dry ingredients. Transfer the flour mixture to the bowl with the banana mixture and stir well until combined. Pour muffin batter into the muffin tray, filling the holes 3/4 of the way up. Bake on the center rack of the preheated oven 18 to 25 minutes, or until muffins are golden-brown around the edges and feel firm when poked in the center. Allow muffins to cool at least 30 minutes before frosting and serving. *Make recipe vegan by making 2 flax "eggs." To do so, stir together 2 Tbsp ground flax seed and 6 Tbsp water in a small bowl. Allow mixture to sit, stirring occasionally, for 15 minutes, until mixture has thickened to the consistency of beaten eggs. Is it possible to substitute coconut flour for tapioca flour. Thanks. Coconut flour absorbs liquid much more than other flours, so it wouldn’t make a good substitute for tapioca flour. Arrowroot would probably work well.